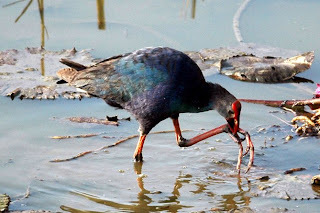 Purple Swamphen (Porphyrio porphyrio), also known as the African Purple Swamphen or Purple Moorhen or Purple Gallinule or Purple Coot , is a large bird in the family Rallidae. From its name in French, talève sultane, it is also sometimes known as the Sultana Bird. 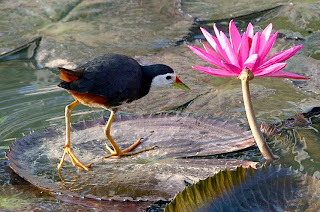 It should not be confused with the American Purple Gallinule, Porphyrio martinica. The common name in New Zealand, used for P. p. melanotus is Pūkeko, and is derEuropean birds are overall purple-blue, African and south Asian birds have a green back, and Australasian and Indonesian birds have black backs and heads. The Philippines subspecies is pale blue with a brown back. This chicken-sized bird, with its huge feet, bright plumage and red bill and frontal shield is unmistakable in its native rangeived from the Māori name for the species. Some authorities separate various subspecies as full species, for example P. p. madagascariensis is split by Sinclair et al as African Purple Swamphen, P. madagascariensis. Coppersmith Barbet or Crimson-breasted Barbet (Megalaima haemacephala), is a bird with crimson forehead and neck. It is a resident near passerine bird from South Asia, with occasional presence in Southeast Asia. The name barbet refers to the bristles or barbs fringing its heavy bill. It may sometimes be referred to simply as Coppersmith. The Coppersmith Barbet is a resident breeder practically throughout South Asia (India, Pakistan, Bangladesh, Sri Lanka etc. ), and is extralimital in Southeast Asia, with related races in Indonesia and the Philippines. The most common barbet, it is found in plains, foothills and terai up to 200m in dry- and moist-deciduous biotope. 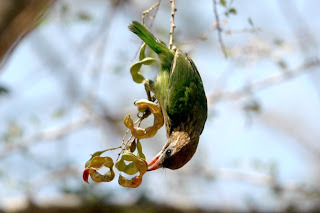 It is entirely arboreal (like most barbets), preferring open wooded country and urban gardens and avoiding dense forest.Local names: Hindi: chhoTA vasant, Bengali: chhoTo basanta, bhAgirath, Gujarati: TukTukiyo Sinhala: mal kottoruwA Tamil: sinna kukuruv. Description: The Coppersmith is brightly coloured, with a black-bordered yellow face with black eye stripes, red forecrown and throat patch. Bill stout and dark. Upper parts are grass green and underparts yellowish-green, diffusely streaked with darker green. Juveniles are duller and lack the red patches. The sexes are alike. Vocalization: The call is a loud rather metallic tuk…tuk…tuk (or tunk), reminiscent of a copper sheet being beaten, giving the bird its name. Repeated monotonously for long periods, starting with a subdued tuk and building up to an even volume and tempo, the latter varying from 1.5 to 2 per second. The beak remains shut during each call - a patch of bare skin on both sides of the throat inflates and collapses with each tuk like a rubber bulb, with much body and tail shaking. Not very vocal in cold weather - a spell of rain or cold immediately silences them, but it is "one of India's most familiar sounds in the hot season"
Diet: Prefers Banyan, Peepul, and other wild figs, various drupes and berries, and the occasional insect, caught in clumsy aerial sorties. Breeding: Season: November to June, mainly February to April. a little later in South India and in Sri Lanka. Often two broods may be raised in quick succession. Nest: a tree hole excavated in a dead or decaying softwood branch usually on average about 40cm deep ending in a slightly widened chamber. Lays 2-4 eggs, normally 3, white longish ovals, non-glossy, laid on bare wood. Average egg size: 25 mm × 17 mm. Period of incubation is unknown. Both sexes help in the house. 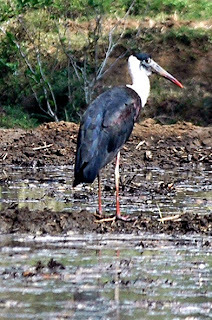 Asian Openbill Stork (Anastomus oscitans) is a large wading bird in the stork family Ciconiidae. It is a resident breeder in tropical southern Asia from India and Sri Lanka east to Southeast Asia. Sometimes it is referred to as just Asian Openbill. Asian Openbill Stork is a broad-winged soaring bird, which relies on moving between thermals of hot air for sustained flight. Like all storks, it flies with its neck outstretched. It is relatively small for a stork at 68cm length. They breed near inland wetlands and build stick nest in trees, typically laying 2-6 eggs. Black Drongo (Dicrurus macrocercus) is a small Asian bird. The drongos are passerines restricted to the Old World tropics. They were previously classed as the family Dicruridae, but that has been much enlarged to include a number of largely Australasian groups, such as the Australasian fantails and the monarchs and paradise flycatchers. 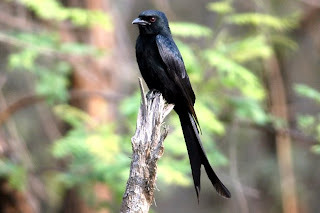 The Black Drongo is a common resident breeder in much of tropical southern Asia from southwest Iran through India and Sri Lanka east to southern China and Indonesia. This species is usually found in open forests and similar lightly wooded habitats, including farmland and habitation. Three or four eggs are laid in a light cup nest placed in a fork often on the bare outer branches of trees. These are aggressive and fearless birds, 28 cm in length, and will attack much larger species if their nest or young are threatened. There are also some cases of Drongos preying on small birds. They have also been on occasion seen feeding on dead fish. The adult Black Drongo is mainly glossy blue-black, although the wings are duller. The tail is long and deeply forked, and there is a white spot in front of the eye. Young birds are dull dark brown.The Black Drongo has short legs and sits very upright whilst perched prominently, like a shrike. It eats insects and other small animals. Description: The Spangled Drongo measures 28cm - 33cm. It has glossy black plumage, with iridescent blue-green spots (spangles) and blood red eyes. Sexes are similar, but the female is slightly smaller. Occasional white spotting can be seen on the upper wings of both sexes. 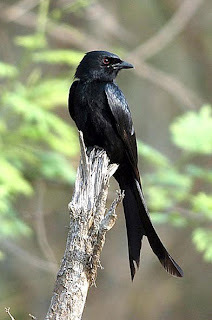 The long, forked 'fish' tail is characteristic, and distinguishes the Spangled Drongo from other similar-sized black birds. Young birds are more sooty black without the spangles and the eye is brown. The Spangled Drongo is noisy and conspicuous, usually active, and frequently aggressive to other species. The voice comprises a variety of sounds, including some distinctive metallic notes like a stretched wire being plucked, and occasional mimicry of other bird species. Several other species are glossy black with red eyes. The Metallic Starling, Aplonis metallica, (21cm - 24cm) is found on the north-east coast, and has black plumage, brightly glossed with green and purple, a bright red eye and long tapered tail. The Trumpet Manucode, Manucodia keraundrenii, (28cm - 32cm) is restricted to northern Cape York Peninsula; it has slender plumes on the nape and throat. 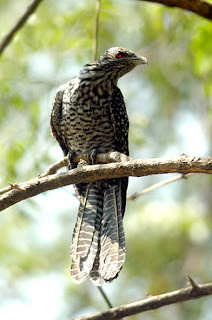 The adult male Common Koel, Eudynamys scolopacea, (40-46 cm) is larger and lacks the spangles and fish tail. Distribution and Habitat: Spangled Drongos are found throughout northern and eastern Australia. They prefer the wetter forests, but can also be found in other woodlands, mangroves and parks. Birds tend to avoid more dense forest types and rainforest interiors. Birds are more common in the north, and are often seen either singly or in pairs. Through its range, the Spangled Drongo shows different migratory habits. Northern populations tend to be more migratory than southern ones. The movements are somewhat mysterious. Individuals from the northern areas of Western Australia and the Northern Territory migrate northwards to Indonesia, while the eastern Australian birds migrate to New Guinea. Some drongos in the south-east and central-east, however, remain in the same area or head south, occasionally turning up in Tasmania. The species is also found in New Guinea and eastern Indonesia. Closely related species occur through south-east Asia to India, China, and the Philippines and on some south-west Pacific islands. Food and Feeding: The Spangled Drongo is usually observed perched on an open branch or telegraph wire, where it awaits a passing insect. Once seen, its prey is pursued in an acrobatic display, and is caught in the drongos slightly hooked bill. The Spangled Drongo then returns to its perch to eat its victim. The prey is guided into the bill with the assistance of sensitive, long, wire-like rictal bristles bordering the bill. Insects are also taken from foliage and from under bark; fruit and nectar also form part of its diet. Breeding: Spangled Drongos breed from September to March, and normally have only one clutch per season. Both adults participate in building the nest, which is a simple, shallow cup of twigs, vine tendrils and grasses, held together with spider web. It is placed in a horizontal fork of tree, normally toward outer edges and up to 10m - 20m above the ground. Both sexes incubate the three to five eggs and care for the young. Spangled Drongos actively defend the nest against intruders. 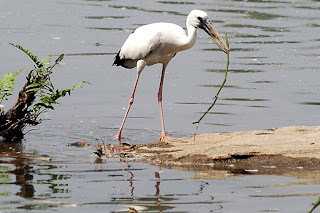 Black-headed Ibis (Threskiornis melanocephalus) is a species of wading bird of the ibis family Threskiornithidae which breeds in South Asia and Southeast Asia from Pakistan to India, Sri Lanka east up to Japan. It builds a stick nest in a tree and lays 2–4 eggs. It occurs in marshy wetlands inland and on the coast, where it feeds on various fish, frogs and other water creatures, as well as on insects. Adults are typically 75 cm long and white-plumaged, with some greyer areas on the wings. The bald head, the neck and legs are black. The thick curved bill is dusky yellow. Sexes are similar, but juveniles have whiter necks and a black bill. Range:Indian subcontenint; Ex. s. Indochina; Java; e. Asia; Four populations; Pakistan, Nepal, India, Sri Lanka. S. Cambodia and s. South Vietnam. Java. C. and ne. China (Hopeh and possibly s. Manchuria). Migrates through Shantung and Honan. Winters in Bangladesh, Burma, Thailand, Cambodia, c. and s. Laos, Vietnam (Mekong Delta), Malaya, Sumatra, w. Java (Pulau Dua), Borneo, e. China from Fukien and Kwangtung to Yunnan and Hainan), Japan (c. Honshu s.), Taiwan, Philippines (Luzon). Indian River Tern or just River Tern (Sterna aurantia) is a bird in the tern family . It is a resident breeder along inland rivers from Iran east through Pakistan into India and Myanmar to Thailand, where it is uncommon. It does not occur in Sri Lanka. Unlike most Sterna terns, it is almost exclusively found on freshwater, rarely venturing even to tidal creeks. This species breeds from March to May in colonies in less accessible areas such as sandbanks in rivers. It nests in a ground scrape, often on bare rock or sand, and lays three greenish-grey to buff eggs, which are blotched and streaked with brown. This is a medium-sized tern, 38-43 cm long with dark grey upperparts, white underparts, a forked tail with long flexible streamers, and long pointed wings. The bill is yellow and the legs red. It has a black cap in breeding plumage. In the winter the cap is greyish white, flecked and streaked with black, there is a dark mask through the eye, and the tip of the bill becomes dusky. As with other Sterna terns, the River Tern feeds by plunge-diving for fish, crustaceans, tadpoles and aquatic insects in rivers, lakes, and tanks. Its numbers are decreasing is due to the pollution of their habitat. It is a slender, graceful, grey and white tern with long, deeply forked 'shallow' tail. It has a deep yellow bill and short red legs. In summer, entire forehead, crown and nape appear glossy jet black in color. In winter, it is greyish white flecked and streaked with black, especially on nape. Both sexes are alike. It lives gregariously, on rivers and jheels, flying up and down. It flies a few feet above water with deliberate beats of the long, slender, pointed wings intently scanning the surface for fish venturing within striking depth. From time to time, it plunges in with closed wings, often becoming completely submerged but soon reappearing with the quarry held across the bill. As it resumes its flight, the victim is jerked up in the air and swallowed head foremost. In addition to fish, crustaceans, tadpoles and water insects are also eaten by the bird. The Indian River Tern's nesting season is chiefly from March to May. The eggs are laid on bare ground on sandbanks of large rivers in colonies. Painted Stork (Mycteria leucocephala) is a large wading bird in the stork family Ciconiidae. It is a tropical species which breeds in Asia from India and Sri Lanka to southeast Asia. It is a resident breeder in lowland wetlands with trees. The large stick nest is built in a forest tree, and 2-5 eggs is a typical clutch. The Painted Stork is a broad winged soaring bird. Like all storks, it flies with its neck outstretched. 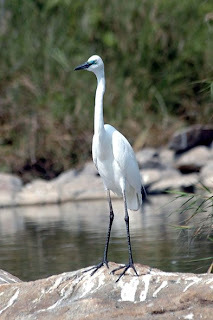 The adult is a large bird, 95-100cm tall, mainly white with black flight feathers. The head is red, and the long downcurved bill is yellow. The tail and legs are pink, and there is dark barring on the breast. Juvenile birds are a duller version of the adult, generally browner and lacking the bright colours of the adult. The Painted Stork walks slowly and steadily in shallow waters or adjacent we and grassland seeking its prey, which, like that of most of its relatives, includes fish, frogs and large insects. It sweeps its head from side to side with its bill half open in water as it hunts for fish. The Painted Stork nests colonially and famous nesting colonies include the ones in the New Delhi Zoological Garden and Kokrebellur in southern India. 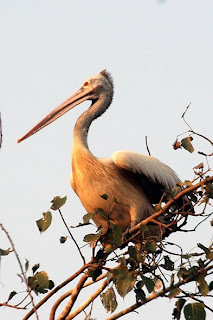 The peak breeding season is from September to November.Another Painted Stork colony is located at Uppalapadu village which is about 10 km towards east of Guntur town in Andhra Pradesh. This is basically a nesting colony of Grey Pelican and Painted Stork who come in thousands during their nesting season from November to April every year. For feeding the chicks they bring fish from sea and river which is about 45 to 50km from the nesting site. Being surrounded by villages and ever increasing demand of land and absence of patronage from the local government, the future of this sanctuary is not very bright. The Painted Stork is tall and slender, standing about 3 feet tall. It is mostly white in color, with black and white markings on its wing and chest feathers. It also has light pink on its lower back. Its legs are pink also. Its head is partly bare of feathers, and is orange-red in color, and its bill is long, yellowish, and slightly curved towards the end. Both male and female look the same, though the female is slightly smaller in height. 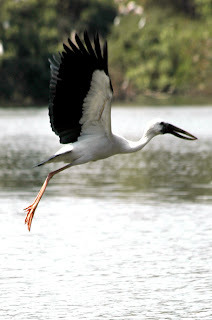 Food: The favorite food of the Painted Stork is fish, though sometimes they will eat frogs as well. The stork sticks its head into shallow water, with its bill partially open, and swings its head back and forth in search of fish. Sometimes it will use a wing to direct fish towards its bill. When it senses it has touched a fish or frog with its bill, it snaps it shut, capturing its capturing its.they will also eat snails. 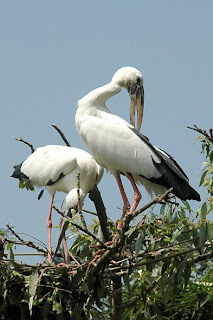 Habitat: This species of stork can be found in the freshwater marshes, ponds, and flooded fields of India, Pakistan, Sri Lanka, eastern China, Kampuchea, and Vietnam. It is found in small numbers in Thailand also, but it's almost extinct in that area and considered threatened in some other areas. It is a protected species at this time. Painted Storks live together in large colonies near water. 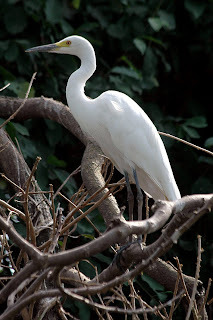 They often share their habitat with other species of storks, as well as herons, ibises, cormorants, and spoonbills. These particular storks make their large nests in the trees close to the water's edge. The nests are made with sticks and lined with leaves. The males do most of the stick gathering, while the females build the nests with the sticks brought back by their mates. 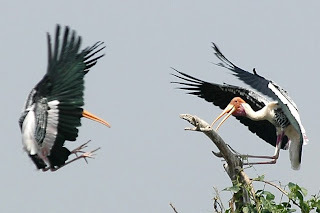 Breeding: Breeding season for the Painted Stork is at the end of the rainy season. At mating time, the male storks perform many ritualistic displays in order to attract a mate. They will preen, fly about, and snap their bills, all in hopes of getting a female stork's attention. Once mated, the pair builds their nest. The female stork lays 3 to 5 eggs, and thenlasts for 27 to 32 days. Both parents incubate their eggs, and both care for their young. Once the hatchlings break free of their shells, they are fed regurgitated fish by their parents until they are able to catch their own food. The baby storks are sheltered from the sun by their parents' partially opened wings. When the storks are young, they are able to make a loud call to attract the attention of their parents, but by the time they are 18 months old they are practically voiceless, just like the adult storks. The young storks are brownish in color when they hatch, and don't grow in their full adult feathers, or plumage, until they are 3 years old. They are fully mature at 4 years old. Senses:As with most other birds, sight and hearing are probably the Painted Stork's most important senses. Communication when young is a loud raucous call; after 18 months old, the storks communicate mainly by clattering their large bills or hissing, or by visual "displays" such as bowing to each other or spreading their large wings. 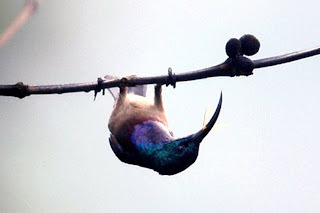 Purple Sunbird(Cinnyris asiaticus) are a group of very small Old World passerine birds which feed largely on nectar, although they will also take insects, especially when feeding young. Flight is fast and direct on their short wings. Most species can take nectar by hovering like a hummingbird, but usually perch to feed most of the time. Purple Sunbird is an abundant resident breeder across tropical southern Asia from the Persian Gulf to Southeast Asia. One to three eggs are laid in a suspended nest in a tree. Purple Sunbirds are tiny, only 10cm long. They have medium-length thin down-curved bills and brush-tipped tubular tongues, both adaptations to their nectar feeding. .This species is found in a variety of habitats with some trees, including forest and cultivation. Red-wattled Lapwing (Vanellus indicus), (local names: Hindi: titeeri, titai, titori, Sindhi: tAteehAr, Gujarati: titodi Kashmiri: hatatut, Assamese: 'bAlighorA', Telugu: yennappa chitawa, Tamil: alkati) is a lapwing or large plover, a wader in the family Charadriidae. 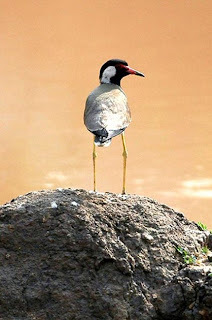 Red-wattled Lapwings are large waders, about 35cm long (somewhat larger than a Rock Pigeon, with longer legs). The wings and back are light brown, but head and chest and front part of neck are black. Prominently white patch runs between these two colours, from belly and tail, flanking the neck to the sides of crown. Short tail is tipped black. A red fleshy wattle in front of each eye, black-tipped red bill, and the long legs are yellow. In flight, prominent white V-shaped wing bar. It usually keeps in pairs or trios in well-watered open country, ploughed fields, grazing land, and margins and dry beds of tanks and puddles. It is also found in forest clearings around rain-filled depressions. It runs about in short spurts and dips forward obliquely (with unflexed legs) to pick up food in a typical plover manner. Is uncannily and ceaselessly vigilant, day or night, and is the first to detect intrusions and raise an alarm, and therefore a nuisance to hunters. Flight rather slow, with deliberate flaps, but capable of remarkable agility when defending nest or being hunted by a hawk.Its striking appearance is supplemented by its noisy nature, with a loud and scolding did-he-do-it call, often uttered at night. Nesting:Season: mainly March to August-September. Has a preference for marshes and similar freshwater wetland habitats. Lays eggs in a ground scrape or depression sometimes ringed around with a few goat droppings or pebbles. About 3-4 black-blotched buff eggs shaped a bit like a peg-top (pyriform), 42x30 mm on average. Nests are difficult to find since eggs and nest usually match the ground to perfection. Diet:Ants, beetles, caterpillars and other insects, snails and other invertebrates, mostly picked from the ground. Also a quantity of vegetable matter. Feeds in the day as well as night. Asian Paradise-flycatcher (Terpsiphone paradisi), also known as the Common Paradise-flycatcher, is a medium-sized passerine bird. It was previously classified with the Old World flycatcher family Muscicapidae, but the paradise-flycatchers, monarch flycatchers and Australasian fantails are now normally grouped with the drongos in the family Dicruridae, which has most of its members in Australasia and tropical southern Asia. The Asian Paradise-flycatcher breeds from Turkestan to Manchuria. It is migratory, wintering in tropical Asia. There are resident populations further south, for example in southern India and Sri Lanka, so both visiting migrants and the locally breeding subspecies occur in these areas in winter. This species is usually found in thick forests and other well-wooded habitats. 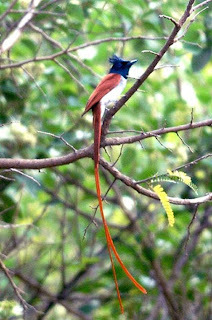 Three or four eggs are laid in a cup nest in a tree.The adult male Asian Paradise-flycatcher is about 20 cm long, but the long tail streamers double this. It has a black crested head, chestnut upperparts and pale grey underparts.By their second year, the males of the migratory Indian race T. p. paradisi (Indian Paradise-Flycatcher) begin to acquire white feathers. By the third year, the male plumage is completely white, other than the black head. Males of the sedentary Sri Lankan race T. p. ceylonensis (Sri Lankan Paradise-Flycatcher) are always chestnut. The female of all races resembles the chestnut male, but has a grey throat, smaller crest and lacks the tail streamers.The Asian Paradise-flycatcher is a noisy bird with a sharp zweet call. It has short legs and sits very upright whilst perched prominently, like a shrike. It is insectivorous, often hunting by flycatching. White-cheeked Barbet (Megalaima viridis) is also known in India as the Small Green Barbet, is very similar to the Brown-headed Barbet (or Large Green Barbet), but this species is endemic to the forest areas of southern India and has distinctive supercilium and broader white stripe below the eye. They also lack the orange eye ring of the other species. The call, a monotonous 'Kot-roo ... Kotroo...' is very similar to that of the Brown-headed Barbet. During hot afternoons, they also call with a single note 'wut' not unlike the call of Collared Scops Owl. These birds are mostly frugivorous, but also feed on termites and other insects. They feed on the fruits of various Ficus species including Ficus benjamina and Ficus mysorensis, and other introduced fruit trees such as Muntingia calabura. While foraging they are quite aggressive and will attempt to chase other barbets, Koels and other frugivores. They nest and roost in tree hollows which they carve out with their strong bills. They usually use large vertical trunk portions of trees. Favoured nest trees in urban areas include Gulmohur Delonix regia and African Tulip Spathodea campanulata. Little Green Bee-eater (Merops orientalis) is a near passerine bird in the bee-eater family MeropidaeIt is resident in a belt across sub-Saharan Africa from Senegal and The Gambia to Ethiopia, the Nile valley, western Arabia and Asia through India to Vietnam.This species should not be confused with the Little Bee-eater, Merops pusillus. Migration is limited to seasonal movements depending on rainfall patterns. 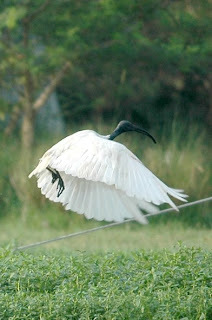 landing on ground to catch its prey in Kolkata. 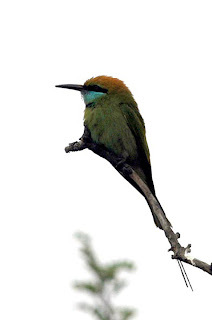 Like other bee-eaters, this species is a richly coloured, slender bird. It always has green upper parts, but the head and underpart colours vary widely depending on the subspecies. Thus, southeast Asian birds have rufous crown and face, and green underparts, whereas Arabian breeders have a green crown, blue face and bluish underparts. The wings are green and the beak is black. It reaches a length of 16-18 cm, including the two elongated central tail feathers. These elongated tail feathers are absent in juveniles. Sexes are alike. This is an abundant and fairly tame bird, familiar throughout its range. It is a bird which breeds in open country with bushes. In Africa and Arabia it is found in arid areas, but is more catholic in its habitats further east. Just as the name suggests, bee-eaters predominantly eat insects, especially bees, wasps and ants, which are caught in the air by sorties from an open perch. This species often hunts from low perches, maybe only a metre or less high. It readily makes use of fence wires and electric wires. Before eating its meal, a bee-eater removes the sting by repeatedly hitting the insect on a hard surface. Unlike most bee-eaters, these are often solitary nesters, making a tunnel in a sandy bank. The breeding pairs are often joined by helpers.They sometimes form small colonies, or nest near other bee-eaters. They lay 4 to 8 spherical white eggs. Both the male and the female take care of the eggs. These birds roost communally, lined up on a tree branch. The call is a soft trill. A study showed that the Little Green Bee-eaters is capable of identifying with the behaviour other animals. It was able to predict whether a predator at a particular location would be capable of spotting the nest entrance and then behave appropriately in disguising its location. The ability to look at a situation from another's point of view was previously believed to be possessed only by primates. White-breasted Waterhen (Amaurornis phoenicurus) is a waterbird.Their breeding habitat is marshes across south Asia from India and Sri Lanka to south China and Indonesia. They nest in a dry location on the ground in marsh vegetation, laying 6-7 eggs. These large 32 cm long rails are permanent residents throughout their range.Adult White-breasted Waterhens have mainly dark grey upperparts and flanks, and a white face, neck and breast. The belly and undertail are cinnamon coloured. The body is flattened laterally to allow easier passage through the reeds or undergrowth. They have long toes, a short tail and a yellow bill and legs.Sexes are similar, but immature birds are much duller versions of the adults. The downy chicks are black, as with all rails.These birds probe with their bill in mud or shallow water, also picking up food by sight. They mainly eat insects, small fish and seeds. They forage on the ground or in low bushes and small trees.Many rails are very secretive, but White-breasted Waterhens are often seen out in the open. 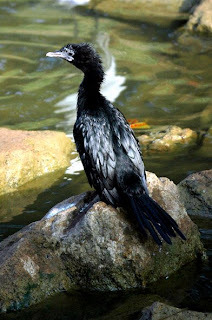 They are noisy birds, especially at dawn and dusk, with a loud ruak ruak call. Breeding: White-breasted Waterhens breed throughout the year. They nest amongst reeds, tall grass or dense undergrowth in both wet and dry habitats. Made about 1-2m above ground, the nest is a shallow cup-shaped pad of twigs, creeper stems or leaves. Or made out of bent over or interlaced tall grass stems topped with a thin lining of grass or weedy materials. Sometimes, it is roofed by surrounding plants. Status and threats: White-breasted Waterhens have adapted well to human activity and are not endangered. However, they are sometimes still hunted as food, and occasionally get run over by cars. Labels: White-breasted Waterhen (Amaurornis phoenicurus) is a waterbird. The belly and undertail are cinnamon coloured. 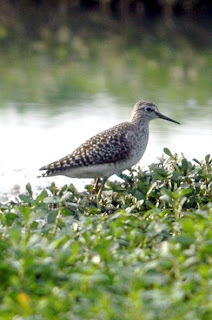 Wood Sandpiper (Tringa glareola) is a small wader. It is the smallest of the shanks, and breeds in subarctic wetlands from the Scottish Highlands across Europe and Asia. It will nest on the ground, or reuse the old tree nest of another bird, such as the Fieldfare. It resembles a longer-legged, elegant Green, or Solitary Sandpiper with a short fine bill, brown back and longer yellowish legs. It differs from the first of those species in that the white rump patch is smaller and less contrasting, and Solitary lacks a white rump anyway. Its closest relative, however, is the Common Redshank, and together they share a sister relationship with the Marsh Sandpiper (Pereira & Baker, 2005). These three species are a group of smallish shanks which tend to have red or reddish legs, and in breeding plumage are generally a subdued, light brown above with some darker mottling, with a pattern of somewhat diffuse small brownish spots on the breast and neck. They migrate to Africa and southern Asia, particularly India. This bird is usually found on fresh water during migration and wintering. These birds forage by probing in shallow water or on wet mud. They mainly eat insects, and similar small prey. Labels: Wood Sandpiper (Tringa glareola) forage by probing in shallow water. It resembles a longer-legged elegant Green or Solitary Sandpiper with a short fine bill brown back and longer yellowish legs. Common Moorhen (Gallinula chloropus) is a bird in the rail family with an almost worldwide distribution outside Australasia as well as deserts, many tropical rainforests, and the polar regions. In North America it used to be called the Common Gallinule, and in Europe it is generally referred to as the Moorhen. This is a common breeding bird in marsh environments and well-vegetated lakes. It is often secretive, but can become tame in some areas. Populations in areas where the waters freeze, such as southern Canada, the northern USA and eastern Europe, will migrate to more temperate climes. It is a distinctive species, with dark plumage apart from the white undertail, yellow legs and a red facial shield. The young are browner and lack the red shield. It has a wide range of gargling calls and will emit loud hisses when threatened. This species will consume a wide variety of vegetable material and small aquatic creatures. They forage while swimming, sometimes upending to feed, or walking through the marsh. About one dozen subspecies are today considered valid; several more have been described which are now considered junior synonyms. Most are not very readily recognizable as differences are rather subtle and often clinal. Usually, the location of a sighting is the most reliable indication as to subspecies identification, but the migratory tendencies of this species make identifications based on location not completely reliable. Old World birds have a frontal shield with rounded top and fairly parallel sides; the tailward margin of the red unfeathered area is a smooth waving line. American birds have a frontal shield that has a fairly straight top and is less wide towards the bill, giving a marked indentation to the back margin of the red area. Despite being a bountiful species, small populations are of course more prone to extinction. 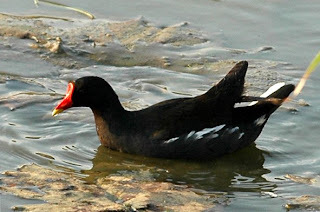 The Mariana Common Moorhen or pulattat (G. c. guami) is very rare nowadays due to destruction of habitat. Only some 300 adult birds remained in 2001, and it is listed as Endangered both federally (since 1984) and locally (Takano & Haig 2004). In addition to the extant subspecies listed below, there are two Pleistocene paleosubspecies known from fossils. These were distinct (generally larger) forms and probably the direct ancestors of some of today's Common Moorhens: Gallinula chloropus brodkorbi from the Ichetucknee River, Florida, and an undescribed Early Pleistocene form from Dursunlu, Turkey (Louchart et al. 1998). 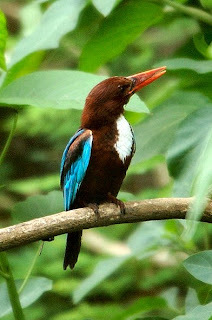 The White-throated Kingfisher (Halcyon smyrnensis) also known as the White-breasted Kingfisher or Smyrna Kingfisher, is a tree kingfisher which is widely distributed in south Asia from Turkey east to the Philippines. This kingfisher is essentially resident over much of its range, apart from seasonal movements. The first of the alternative English names is to be preferred because the geographical name is too restrictive for this widespread bird, and the easternmost race lacks a white breast. This is a large kingfisher, 28 cm in length. The adult has a bright blue back, wings and tail. Its head, shoulders, flanks and lower belly are chestnut, and the throat and breast are white. There are four races differing mainly in plumage shades, but H. s. gularis of the Philippines has only the neck and throat white. The flight of the White-throated Kingfisher is rapid and direct, the short rounded wings whirring. The large bill and legs are bright red. In flight, large white patches are visible on the blue and black wings. Sexes are similar, but juveniles are a duller version of the adult. The call of this noisy kingfisher is a chuckling chake-ake-ake-ake-ake. White-throated Kingfisher is a common species of a variety of habitats with some trees, and its range is expanding. 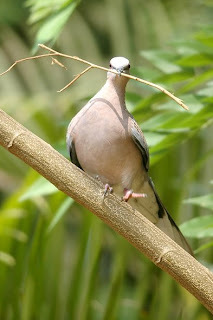 It perches conspicuously on wires or other exposed perches within its territory, and is a frequent sight in south Asia. This species mainly hunts large insects, rodents, snakes, fish and frogs. It is reputed to eat tired migratory passerine birds like Chiffchaffs where the opportunity arises. White-throated Kingfisher has a striking display in which the wings are spread to show the white patches. The nest is a 50cm tunnel in an earth bank. A single clutch of 4-7 round white eggs is typical. Labels: White-throated ( Halcyon smyrnensis)The flight of the White-throated Kingfisher is rapid and direct the short rounded wings whirring. 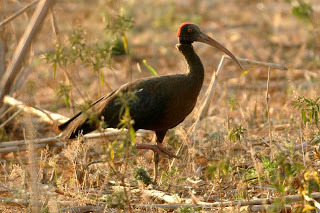 The large bill and legs are bright red. Golden Oriole or Eurasian Golden Oriole (Oriolus oriolus) is the only member of the oriole family of passerine birds to breed in northern hemisphere temperate regions. It is a summer migrant to Europe and western Asia, wintering in the tropics. It is a bird of tall deciduous trees in woodland, orchards or parks. The tiny British population breeds in commercial Black poplar plantations, notably at the RSPB Lakenheath Fen nature reserve, where a watchpoint is operated during nesting. The neat nest is built in a fork in a tree, and contains 3-6 eggs. The food is insects and fruit, found in the tree canopies where the orioles spend much of their time. The male is striking in the typical oriole black and yellow plumage, but the female is a drabber green bird. Orioles are shy, and even the male is remarkably difficult to see in the dappled yellow and green leaves of the canopy. The flight is somewhat like a thrush, strong and direct with some shallow dips over longer distances. The call is a screech like a jay, but the song is a beautiful fluting weela-wee-ooo or or-iii-ole, unmistakable once heard. The name "oriole" was first used in English in the 18th century, and is an application of the scientific Latin genus name, which is ultimately from the Classical Latin "aureolus" golden. Various forms of "oriole" have existed in Romance languages since the 12th and 13th centuries. Albertus Magnus used the Latin form oriolus in about 1250, and stated, erroneously, that it was onomatopoeic, from the song of the Golden Oriole. The New World orioles are similar in appearance to the Oriolidae, but are icterids unrelated to the Old World birds. Labels: Eurasian Golden Oriole (Oriolus oriolus) The neat nest is built in a fork in a tree.The food is insects and fruit found in the tree canopies where the orioles spend much of their time. 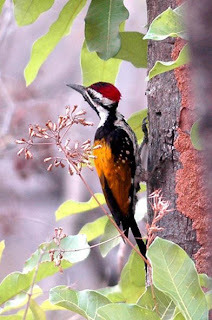 Black-rumped Flameback, (Dinopium benghalense), also known as the Lesser Golden-backed Woodpecker, is a woodpecker which is a widespread and common resident breeder in much of South Asia. This flameback is a species associated with open forest and cultivation. It nests in a tree hole, laying three white eggs. Like other woodpeckers, this species has a straight pointed bill, a stiff tail to provide support against tree trunks, and zygodactyl or "yoked" feet, with two toes pointing forward, and two backward. The long tongue can be darted forward to capture insects. The Black-rumped Flameback is a large species at 26-29 cm in length. 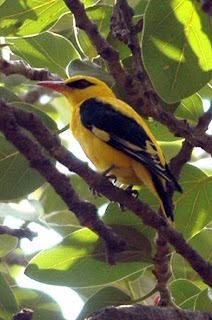 It is a typical woodpecker shape, and has a golden yellow back, with paler wings. The rump and tail are black. The underparts are white with dark chevron markings. 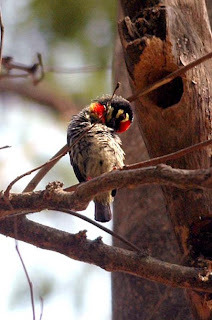 The black throat immediately separates it from other golden backed woodpeckers in the Indian region. The head is whitish with a black nape and throat, and there is a greyish eye patch. Unlike Greater Flameback, Chrysocolaptes lucidus, it has no dark moustache stripe. The adult male Black-rumped Flameback has a red crown. Females have a dark forecrown, with red only on the rear half. Young birds are like the female, but duller. The Sri Lankan subspecies D. b. psarodes has a crimson back and all the dark markings are blacker and more extensive. 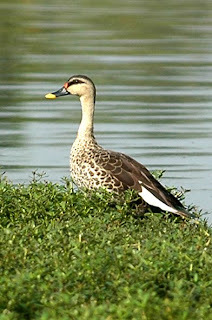 It is sometimes considered a separate species from the nominate Indian form. However, in the Sibley-Ahlquist taxonomy, the Hoopoe is separated from the Coraciiformes as a separate order, the Upupiformes. It is the only extant member of its family, although what are now considered subspecies, such as the resident African form U. e. africana, were formerly sometimes given specific status. 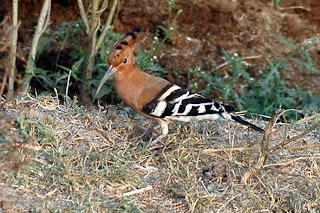 Hoopoes are widespread in Europe, Asia and North Africa, as well as Sub-Saharan Africa and Madagascar. They migrate from all but the southernmost part of their range to the tropics in winter. Their habitat is open cultivated ground with short grass or bare patches. They spend much time on the ground hunting insects and worms. That diet may have been among the reasons the Hoopoe is included on the Old Testament's list of unclean birds (see Leviticus 11:19 and Deuteronomy 14:18). The Hoopoe is 25–29cm long, with a 44–48cm wingspan. This black, white and pink bird is quite unmistakable, especially in its erratic flight, which is like that of a giant butterfly. The crest is erectile, but is mostly kept closed. It walks on the ground like a starling.The song is a trisyllabic "oop-oop-oop", which gives rise to its English and scientific names. 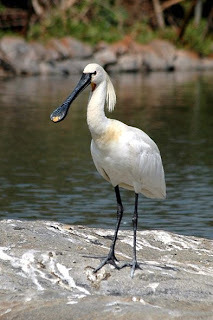 The Common Spoonbill differs from the African Spoonbill with which in overlaps in winter, in that the latter species has a red face and legs, and no crest. The Common Spoonbill occurs in marshy wetlands with some open shallow water, nesting in colonies in trees or reedbeds. It does not usually share colonies with storks or herons. The Common Spoonbill usually lays four eggs. It feeds on various fish, frogs and other water creatures. Labels: Common Spoonbill (Platalea leucorodia) The Spoonbill frequents marshers ponds and mud-banks around areas of inland water.A resident winter visitor in west and north. These birds stand still at the water's edge and wait to ambush prey, mainly at night. They primarily eat small fish, crustaceans, frogs, aquatic insects, and small mammals. During the day they rest in trees or bushes. 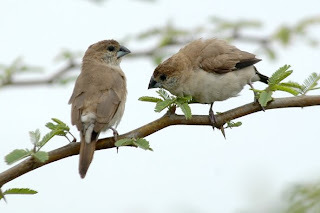 The New World race is more gregarious outside the breeding season than the nominate race.They are often found nesting or roosting within cities in avenue trees on busy roads. Spotted Owlet (Athene brama) is an owl which breeds in tropical Asia from India to Southeast Asia. This species is a part of the larger grouping of owls known as typical owls, Strigidae, which contains most species of owl. The other grouping is the barn owls, Tytonidae. Spotted Owlet is a common resident bird in open habitats including farmland and human habitation. It nests in a hole in a tree or building, laying 3-5 eggs. 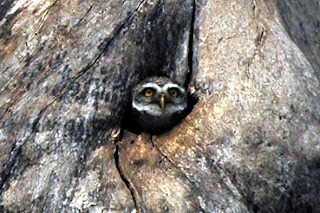 The Spotted Owlet is small (21cm) and stocky. The upperparts are grey-brown, heavily spotted with white. The underparts are white, streaked with brown. The facial disc is pale and the eyes are yellow. There is a white neckband. Sexes are similar. The flight is deeply undulating. Labels: Spotted Owlet (Athene brama) This species is a part of the larger grouping of owls known as typical owls, Strigidae, which contains most species of owl. Stone-curlews or Thick-knees are a group of largely tropical waders in the family Burhinidae. They are found worldwide within the tropical zone, with some species also breeding in temperate Europe and Australia. They are medium to large waders with strong black or yellow black bills, large yellow eyes—which give them a reptilian appearance—and cryptic plumage. The names Thick-knee and Stone-curlew are both in common use, the preference among authorities for one term or the other varying from year to year. The term Stone-curlew owes its origin to the broad similarities with true curlews (which are not closely related). 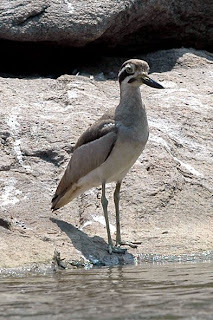 Thick-knee refers to the prominent joints in the long yellow or greenish legs and apparently originated with a name coined in 1776 for B. oedicnemus, the Thick-kneed Bustard. Despite being classed as waders, most species have a preference for arid or semi-arid habitats. They are largely nocturnal, particularly when singing their loud wailing songs, which are reminiscent of true curlews. Labels: Eurasian Thick-knee or Stone-curlew (Burhinus indicus) It is a medium-sized wader with a strong yellow and black beak large yellow eyes. 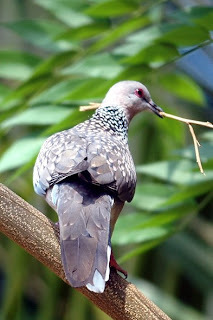 Spotted Dove (Streptopelia chinensis), also known as the Spotted Turtle Dove, is a pigeon which is a resident breeding bird in tropical southern Asia from India and Sri Lanka east to south China and Southeast Asia. They are also known as the (Indian/Chinese) Spotted Turtle Dove. It is a common and widespread species in open woodland, farmland and habitation over a good deal of its natural range, and this successful bird has also been introduced to the U.S. in the Los Angeles, California area. other countries it has been introduced to include northern Indonesia, Australia and New Zealand. 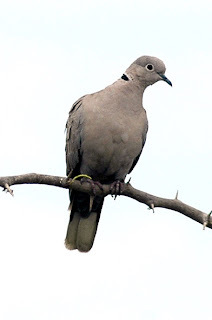 In Australia, it was introduced in Melbourne in the 1860s and has since spread, often replacing native doves. In Australia, they are now found in streets, parks, gardens, agricultural areas and tropical scrubs, from Hobart, Tasmania to Cooktown, Queensland to Port Lincoln, South Australia. They can also be seen in Perth, Pemberton, Kalgoorlie and Esperance, in Western Australia. The species' range is expanding. 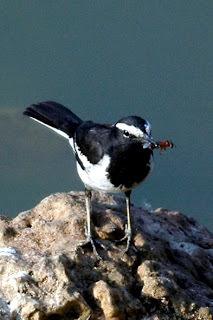 The White-browed Wagtail is a resident breeder in India and is endemic to the Indian subcontinent. It is found in open freshwater wetland habitats. It is one of the few Motacilla wagtails that has adapted well to urban habitats and is often found perched on overhead water storages in residential buildings. This species appears to belong to the white-bellied black-throated superspecies like the White Wagtail. 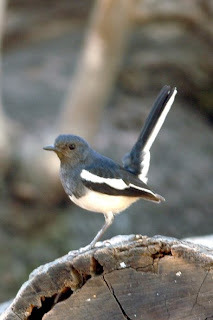 It is most similar in external appearance to the Japanese Wagtail and to Hodgson's Wagtail, a subspecies of the White Wagtail (M. alba alboides). Its song much resembles that of the recently-described Mekong Wagtail, which may or may not be a coincidence. mtDNA cytochrome b and NADH dehydrogenase subunit 2 sequence data is not able to robustly resolve the relationships of these birds, especially in respect to the Blue-headed Wagtail and its relatives (Voelker, 2002). The White-browed Wagtail is the largest species of wagtail at 21 cm length. It is a slender bird, with the characteristic long, constantly wagging tail of its genus. 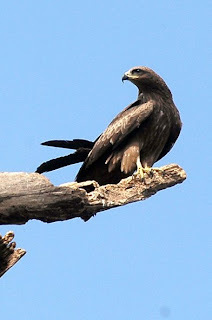 It has black upperparts, head and breast, with a white supercilium and large white wingbar. The rest of the underparts are white. The female has the black coloration less glossy than in the male. Juveniles are brown-grey where the adult is black. 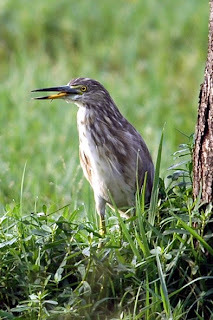 Indian Pond Heron (Ardeola grayii) is a small heron. It is of Old World origins, breeding in southern Iran and east to India, Burma and Sri Lanka. This is a stocky species with a short neck, short thick bill and buff-brown back. In summer, adults have long neck feathers. Its appearance is transformed in flight, when it looks very white due to the colour of the wings. It is very similar to the Squacco Heron, Ardeola ralloides, but is darker-backed. 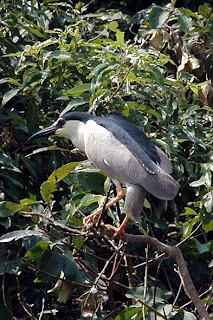 To the east of its range, it is replaced by the Chinese Pond Heron, Ardeola bacchus. This is a very common species in India, where it is often quite tame and easily approachable. It can often be seen foraging around rubbish heaps on the outskirts of villages, as well as in more natural habitats. This bird was first described by Colonel W. H. Sykes in 1832 and given its scientific name in honour of John Edward Gray. Labels: Indian Pond Heron (Ardeola grayii) where it is often quite tame and easily approachable. It can often be seen foraging around rubbish heaps on the outskirts of villages. Labels: The Little Cormorant (Phalacrocorax niger)This bird can dive to considerable depths but usually feeds in shallow water. It frequently brings prey to the surface. A wide variety of fish are taken. Labels: Inermediate Egret (Mesophoyx intermedia) The feathery aigrette in this species hangs only from the front and back. Inermediate Egrets make stick nest in mixed colonies and hunt with an erect posture. Labels: Great Egret (Casmerodius albus) A more solitary bird than others of the egret family, the great lives and hunt in deeper water. Acrick in the gape extending behind the eye. 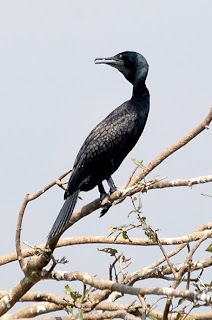 Labels: Indian Cormorant (Phalacrocorax fusicollis) This birds are found in their company even when fishing. Inhabits small lakes and rivers, nesting in mixed colonies during the monsoon season. Labels: Black-headed Ibis (Threskiornis melanocephalus) A bird that prefers marshy land which it walks across in search food, using a peculiarly shaped bill like a pair of forceps to probe into the soft mud. Labels: Green Bee eater (Merops Orientalis) From such a perch as the one seen here or from a more obvious one like a barbed wire fence, these birds will fly off to snap up a bee in their braks. Labels: Black Drongo (Dicrurus macrocercus) Black drongo can often be seen perched on telegraph wires and other points of vantage from where it swoops down to satch insects particularly grasshoppers. Labels: Jungle Myna (Acridotheres fuscus) The Jungle Myna builds a nest in hole. The bill and strong legs are bright yellow and there is no bare skin around eye. The head has a forehead tuft. Labels: Indian Black ibis (Pseudibis papillosa) usually found at a distance from water, this bird has its favourite locations and likes to roost on trees. 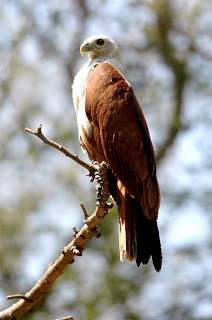 Labels: The Brahminy Kite (Haliastur indus) also known as the Red-backed Sea-eagle Found in the vicinity of villages and moving inland during the monsoon season to feed on land crabs and frogs. Eurasian Collared Dove, Streptopelia decaocto, also called the Eurasian Collared-Dove or simply the Collared Dove, is one of the great colonisers of the avian world. Its original range was warmer temperate regions from southeastern Europe to Japan. However, in the twentieth century it expanded across the rest of Europe, reaching as far west as Great Britain by 1953, and Ireland soon after. It also now breeds north of the Arctic Circle in Scandinavia. It is not migratory. This is a small dove, buff grey with a darker back and a blue-grey wing patch. The tail feathers are tipped white. It has a black half-collar on its nape from which it gets its name. The short legs are red and the bill is black. The iris is reddish brown, but from a distance the eyes appear to be black, as the pupil is relatively large and only a narrow rim of reddish-brown eye colour can be seen around the black pupil. Labels: Euarasian Collared Dov (Streptopelia decaocto) prefering dry country, particularly open and cultivated, this Dov likes groves where it can retire the middayheat. Labels: Black Kite (Milvus migrans) Black Kites will take small live prey as well as fish, household refuse and carrion. They are attracted to fires and smoke where they seek escaping insect prey. Labels: Spot-billed Duck (Anas poecilorhyncha) While moving across the water, these ducks feed largely on what the surface of the water has tob offer; they will also upend themselves. Labels: Woolly-necked Stork (Ciconia episcopus) The Woolly-necked Stork is one of the species to which the Agreement on the Conservation of African-Eurasian Migratory Waterbirds (AEWA) applies. 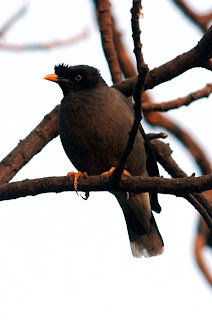 Common Myna (Acridotheres tristis), is a myna, a member of the starling family. This bird is native in southern Asia from Iran and Kazakhstan to Malaysia and China, and in Egypt. 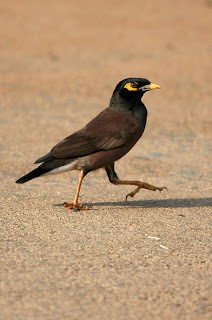 It is also known as the Indian Myna and as the Talking Myna for its ability to mimic human speech. In India, it is called Lali or Lalee. In urban settings, it thrives on household trash and restaurant waste. It has been introduced widely elsewhere, including adjacent areas in Southeast Asia, the Middle East, South Africa, Israel, North America, Australia, New Zealand and various oceanic islands, including a very prominent population in Hawaii. This abundant passerine is typically found in open woodland, cultivation and around habitation. The Common Myna builds a nest in hole in a tree or wall. The normal clutch is 4–6 eggs.